For our era of stubbornly high unemployment, the report offers this interesting tidbit: Fruit and vegetable farms that sell into local markets employ 13 full-time employees per every $1 million in sales, versus just 3 employees for their counterparts that sell into global commodity markets. In other words, a dollar you spend at the farmers market supports four times as many workers as a dollar spent at the supermerket. Now the scary chart. The National Young Farmers Coalition (NYFC), which represents the new guard of farmers rising to grow for local markets, has conducted an interesting study of the challenges and opportunities facing young growers. 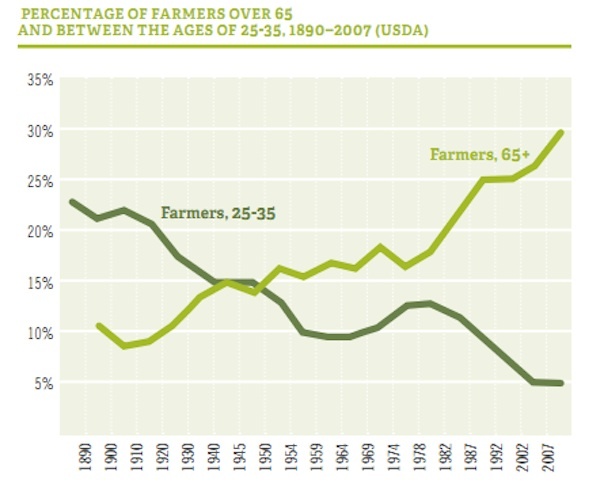 As the following chart from the report shows, their problems are everyone’s—the nation’s farmers are aging rapidly. The NYFC surveyed 1300 young farmers and asked them to name the biggest obstacles they face. The top answers all essentially relate to start-up money: lack capital (78 percent of respondents), land access (68 percent), health care (47 percent), and access to credit (40 percent). Even healthcare can be thought of in start-up terms: Who wants to enter a physcial career that offers no prospect of affordable health care? 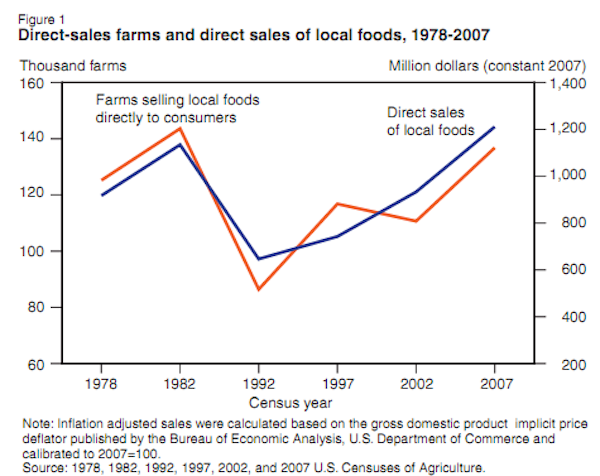 Yet as the top chart shows, once local-oriented farmers get up and running, there’s a robust and growing market for their goods. The NYFC report ends with an excellent discussion about how federal farm policy could be tweaked to make condistions friendlier to incoming growers.